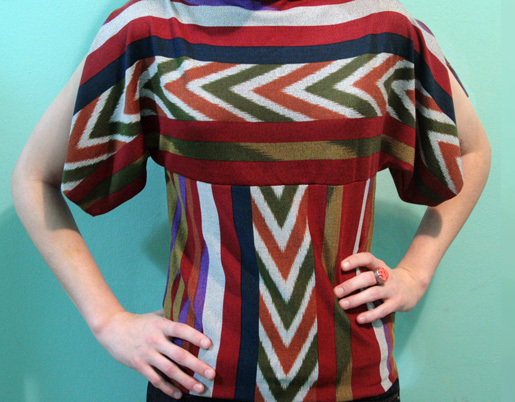 Easy to sew and even cuter to wear, the Haute Top gives the everyday, basic top a chic twist. Make this project your own by choosing a bold print with a vintage feel or a basic go-to color that goes perfectly with your favorite statement necklace. Either way, the light knit fabric makes this top so versatile—wear it with a pair of jeans or a pencil skirt for a night out on the town. Step 1) Cut your fabric pieces. Use a measuring tape to determine your waist’s circumference. Measure on your body from the neckline to just below your bust, or about an inch below your bra’s bottom edge. Following the diagram, draw your pattern using your body’s measurements. Draw the registration marks along the top and bottom edges as shown. Cut two out from your fabric on the fold. Transfer the registration marks to the fabric. Cut two rectangles that are as wide as half your waist circumference plus 1″. 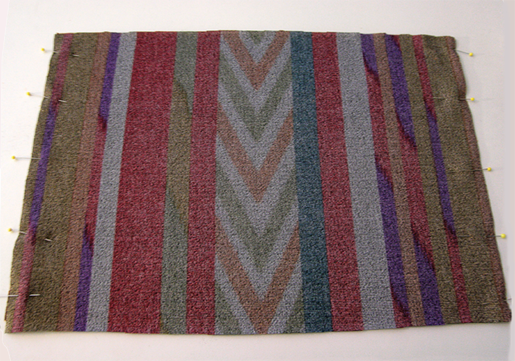 Make the rectangles 11″ long. 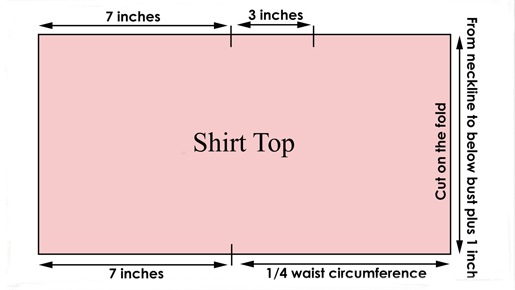 Step 2) Construct your shirt. 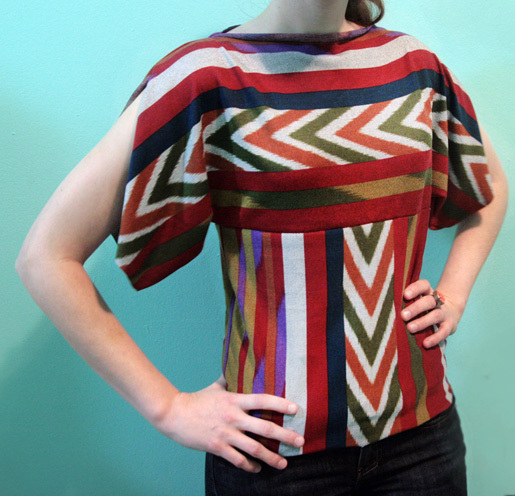 With right sides together and raw edges aligned, sew the shirt tops’ bottom edges together using a 1/2″ seam allowance. Start from each end and sew for only 7″ or until the registration mark, leaving the center unsewn. With right sides together and raw edges aligned, pin the shirt tops’ top edges together. Measure in from edge 7″ to the first registration mark. 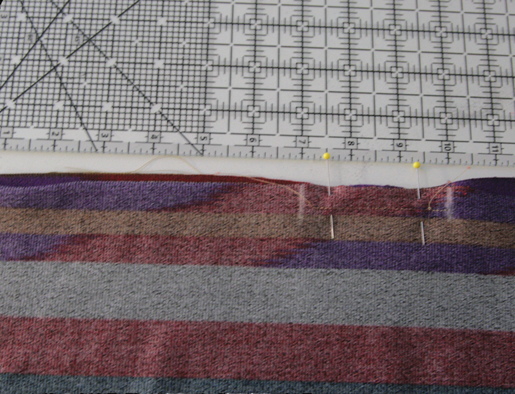 Starting at the mark sew 3″ along the edge with a 1/2″ seam allowance to the next registration mark. Repeat for the other end. With right sides together and raw edges aligned, pin the two shirt bottom pieces together along their 11″ edges. Sew along each edge with a 1/2″ seam allowance. 7. Attach the shirt bottom to the shirt top. With right sides together, pin the shirt bottom to the shirt top. Align the shirt bottom’s top edge with the raw edge on the shirt top’s bottom edge. Make sure the side seams are aligned and sew with a 1/2” seam allowance using a zigzag stitch.